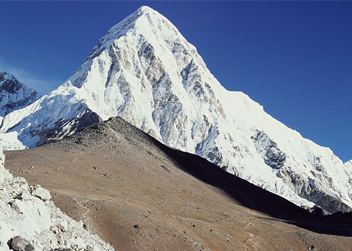 Mount Everest is the highest mountain in the world and the best place for the adventure lover. The Everest Base Camp trek is one of the most popular trekking routes in the Himalayas where thousands of trekker visited each year. 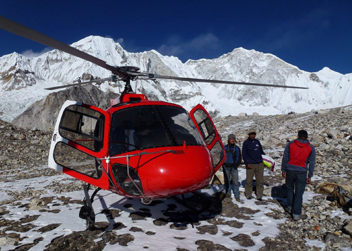 In this trek, you will see panoramic views of Everest and the other Himalayas in close up. Arrival at Tribhuvan International Airport at Kathmandu and meet, assist and transfer to the hotel by our representative. Welcome drinks on arrival and briefing of the tour program by one of our representative from the company. 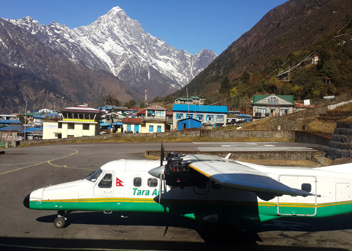 Fly to Lukla early in the morning from Kathmandu Tribhuvan Domestic Airport. It is 30 minutes flight. Lukla is located at the altitude of 2800m so there will be quite cold than in Kathmandu. After walking a few minutes from Lukla airport, stop at a restaurant for breakfast. 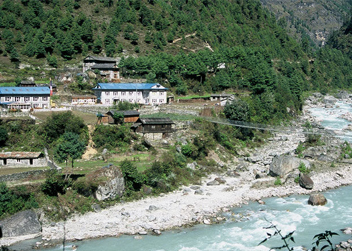 Books, internet facility and trekking gear are available in Lukla. After breakfast, the journey starts from Lukla. Today we have to walk for 3-4 hours to reach Phakding through Chaurikharka, Chiplong, Thadokovi and Ghat. We can see the spectacular Himalayan view from Chiplong and Thadokovi. The religion of the people of this region is Buddhism so we can see many monasteries, Maane and script are written on the rock in Tibetan language. Today the journey is not so difficult. Phakding (2652m) is at low altitude than Lukla so we feel quite warmer here than in Lukla. Phakding is a commercial place so we can see hotel and Bhattis over there. Today the journey starts after breakfast. To reach Namche we have to walk through Tok-Tok, Mamju, Jorsalle. The journey from Phakding to Jorsalle is quite easy. There is Everest National Park at Manju so, we have to check in there as a first check point. Then after an hour walk along the bank of Dudkoshi River we reach at Jorsalle where we will have breakfast. There is no any shop available between Jorsalle to Namche. From Jorsalle after some minutes we have to cross Dudhkoshi River and bridge. After bridge there is steep up route we have to follow. 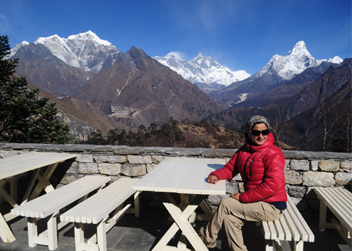 If the weather is clear we can see Mount Everest from Thami danda. We can see many beautiful mountains, waterfalls, Mane on the way. Namche is situated at 3440m altitude so we feel cold out there. We can see different mountains from Namche. Namche is the biggest commercial area of Everest Region where we can find everything needed to Trekkers like internet facility, ATM. But sometimes due to technical reason ATM does not work. From every Friday to Saturday a special type of fair held here. Bakery café and Pub are also available in Namche. Today is the day for acclimatization. 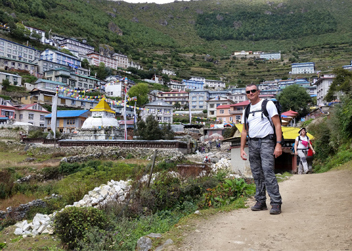 We can take a short hike of 5-6 hours for which we have to walk steep up from Namche to Syangboche then to Everest View Hotel to Khumjung where lunch can be taken. 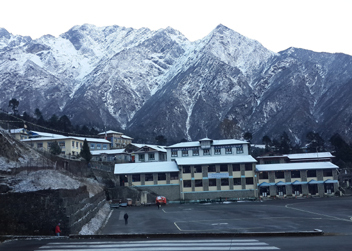 At Khumjung we can also see Monastery and the school made by Sir Edmund Hilary. During this trekking we will get chance to see many beautiful mountains. You can also visit Sherpa Museum located at Namche. After a day hiking return to Namche, have dinner and overnight. Today the journey begins after breakfast as usual. Today we have to reach Tengboche from Namche through Sanasa, Phunki Tanga. We can walk easily from Namche to Phunki Tanga because the route is straight down. You will have lunch at Punki Tanga. After Phunki Tanga, the journey is steep up till Tangboche. During the journey you can view beautiful mountains and the traces of Buddhism culture and people. 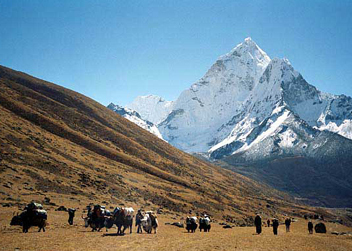 Tangboche is located at 3870m height. 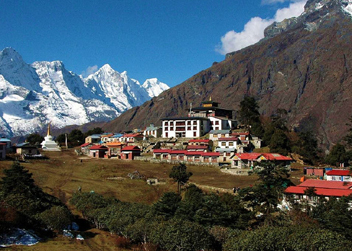 Tangboche is a small place consisting of 5 hotels. Internet facility is available here. It is the best spot to view Ama Dab lam Mountain. Enjoy the sunrise view from Tangboche. It is a very famous for Sunrise view. Today the trekking starts after breakfast as usual. Today’s journey is down straight and straight up so can be done easily. Then follow down from Tengboche to Dudhkoshi then by walking at the bank of the river you will reach at Dingboche. 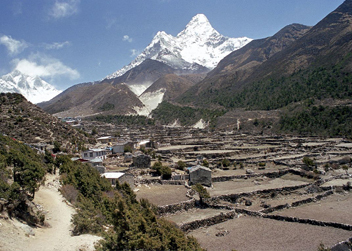 Dingboche is the highest altitude place of Nepal where plant vegetation and crops like potato are grown. Today is also for the acclimatization. You can hike according to your choice. You can go to Chhukung Village. Chhukung is located at the height of 4700m. From here you can see the top most part of Mount Makalu, Imja glacier and lake. In the evening return to Tangboche, Dinner overnight. After breakfast, you can visit Chorten at Dingboche then move to Thukla where the route is straight up and can be done easily. Have lunch at Thukla. After that take a steep up route and view the statue of those who had lost their life during Everest Expedition. 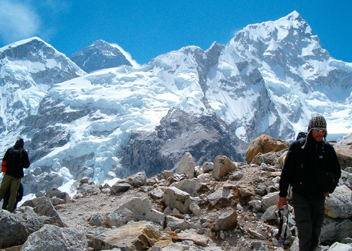 Then after walking sometimes you will reach at Lobuche at the height of 4900m. 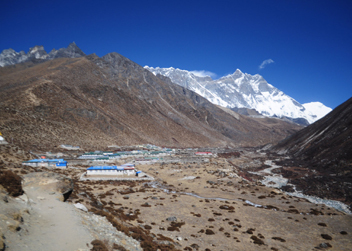 Today you can see Pumori Mountain and Khumbu Glacier for which you can go through Khombala from Lobuche. 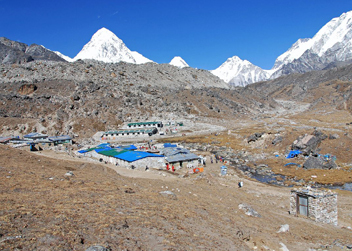 Lobuche is a very colder place with 5-6 hotels, lodges, and guest houses. 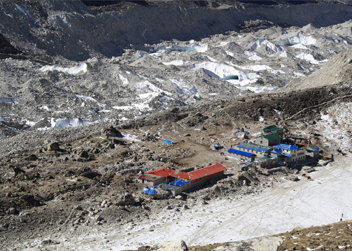 The trail to Gorak Shep goes ahead through the lateral moraine of the Khumbu Glacier. We pass through the pyramid signpost. Ahead on the trail we see crest of the north ridge of Everest along with Mt. Pumori, Mt. Mahalangur, Mt. Lingtern, Mt. Khumbutse, Mt. Nuptse, etc. A small ascent would take us to Thangma Riju from where we perceive 360 degree vista of snowy mountains. Climbing steeply up to the top through the torrent of Changri Glacier, we catch our first glimpse of Kala Patthar, a grey-green knoll beneath the Mt. Pumori. As we reach Gorak Shep, we will find snow-capped mountains looming all around us including the top of the world - Mt. Everest. After a brief lunch and rest, we take the trail to Everest Base Camp through the once vast Gorak Shep Lake. Mountaineer's tents stand out in bright colors against the monotony of gray surroundings (especially in the Spring). 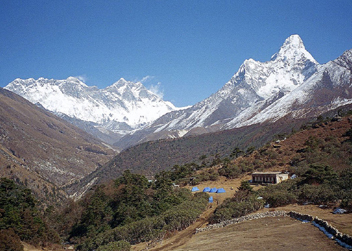 Nuptse, Khumbuste and Pumori are the mountains we can view from the base camp. Everest actually is not visible from here. By now we have met the ultimate objective of our trip. Today is the climax of our trip. We start early in the morning to catch the dramatic views from Kala Patthar and witness the first light of day caress the peaks of the mountains, particularly, Mt. Everest. However, we need to be prepared for an early morning departure, amid predawn darkness and cold temperature (-10 to -14 C). Further, there is always the potential for chilly winds which are quite common. Familiar peaks such as Lingtren, Khumbutse, Changtse tower to the east even as Everest begins to reveal itself. 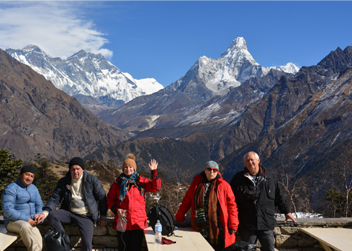 During the ascent to Kala Patthar, we can pause to catch breath at several outstanding view points from where we can snap great pictures. After several hours of ascent, we reach Kala Patthar. From kala Patthar, we scramble up to the top of a rocky outcrop marked by cairns and prayer flags. Mind-blowing Himalayan panorama unfolds before our eyes as they wander from one mighty massif to another. We can take as many pictures as we want with our camera but do not forget to imprint the vista into our mind's eye so that it lasts a lifetime. Fly back to Kathmandu early in the morning. After 9 – 10 AM there will be no flights because of strong wind. Check in hotel. Rest of the day is free for rest and refreshment in the hotel. Evening take your own time for leisure. Approximately 3 hours before your scheduled flight a representative from Aarya Village Travel will transfer you to the airport for final departure to your home country. •	Tea House Accommodations, English Speaking License Holder Guide and all his expenses, all meals during trekking, trekking map. 8. Hotels check out as per the hotel rules.